Australian researchers have isolated an immune system cell in salamanders which helps it regenerate missing limbs and damaged organs — and they suspect the same thing could work in humans, too. 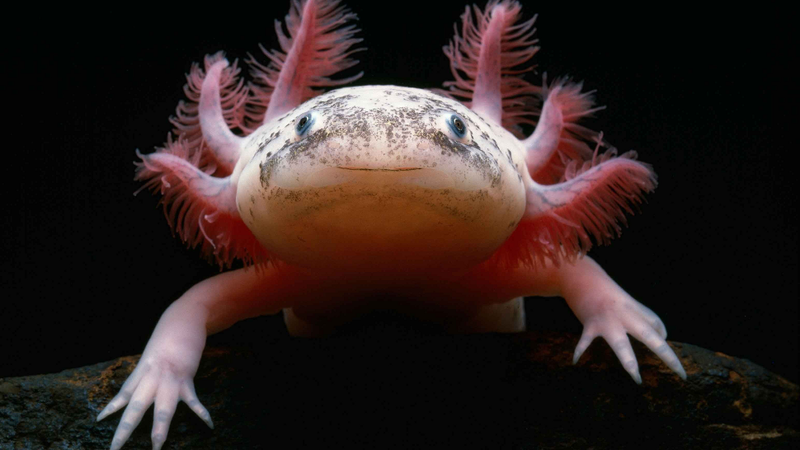 Salamanders, or axolotls, are unique among vertebrates in that they’ve got remarkable regenerative powers. Adults can literally regrow and restore function to any part of the body, including the spinal cord and heart — even parts of the brain. Moreover, the regenerated tissue is scar free; once repaired, the new tissue looks almost the same as it was before. Mammals obviously can’t do this. When we suffer tissue damage, the growth response is severely limited, while also being subject to scarring. Now, thanks to the work of James Godwin and colleagues at Monash University's Australian Regenerative Medicine Institute, scientists are one step closer to figuring out how to transfer the salamander’s regenerative powers to humans. A crucial part of the healing process involves the presence of macrophages — a major immune system cell type that patrols tissues and gobbles-up foreign invaders, like bacteria and fungi. What’s more, they also play an important role in determining the mode of repair and instigating the tissue regeneration process. Godwin et al. determined this after they got rid of all the macrophages in the salamanders they were experimenting upon. Devoid of these immune cells, the salamanders completely lost their ability to regrow limbs. In a manner of speaking, they suddenly became mammal-like — left with stumps and scarred tissue. But then, after the macrophages were re-introduced, their regenerative capacities were restored, and the salamanders were able to grow their limbs back. "Previously, we thought that macrophages were negative for regeneration, and this research shows that that's not the case — if the macrophages are not present in the early phases of healing, regeneration does not occur," he said in a press statement. "Now, we need to find out exactly how these macrophages are contributing to regeneration. Down the road, this could lead to therapies that tweak the human immune system down a more regenerative pathway." The researchers theorize that chemicals released by the macrophages are crucial for regeneration. And indeed, this is the next phase of their research. Their ultimate goal is to reverse-engineer these techniques into human therapies — a medical breakthrough that could lead to treatments for heart and liver diseases associated with scarring (fibrosis). It could also lead to therapies for the treatment of spinal cord and brain injuries. Image: National Geographic/Stephen Dalton/Animals Animals—Earth Scenes.